This was so good! I love it! I love this so very much, and luckily I’ve been on vacation so I was able to just blast through this book within 30 hours (which did include a full night’s sleep, for which self-control I should definitely get kudos.) Of course, now I’ve finished it, and that is a travesty and I may need to start it all over again. Novik created a world of magic and politics and then wrote these gorgeous, vivid descriptions, and complex characters. I love Agnieszka (the main character) and I can empathize with literally every other character who appears, good and evil and in-between. The characters are complex and human. The story is a fairytale, but it’s also a fully developed novel and it addresses the difficulties and horrors that get skimmed over so easily in a short fairy tale. 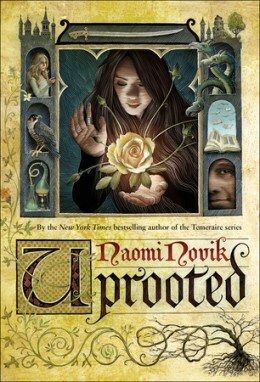 Uprooted reminded me of Robin McKinley’s various fairytale books, but I think I like this even more. Unlike McKinley’s stories, Uprooted is an original story with original characters, but is steeped in Polish and Russian folklore. The story starts with Agnieszka being picked as the once-very-ten-years tribute to the Dragon. The Dragon is actually the local lord and an immortal wizard who protects the land from the Woods, which are quite dangerous. It’s unclear what happens when he takes his tribute except that when they are released after ten years, they are well-dressed, well-spoken, are delighted to see their families, but refuse to live anywhere near the Woods ever again. After that, things happen! And it’s all very exciting. 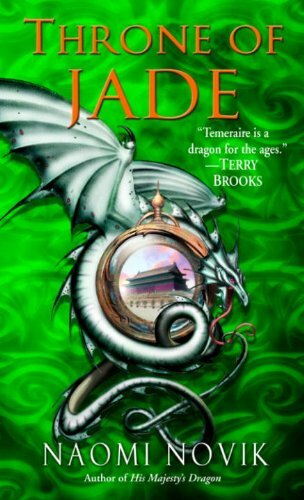 In honor of Crucible of Gold being released this last Tuesday, I have to go back and review His Majesty’s Dragon and Throne of Jade, the first two book in the Temeraire series. I have to admit that I’ve actually only read the first two books. However! The reason for that is that I am clearly insane. Despite how I don’t do this for any other series in the world, I can never seem to start the third book without wanting to go back and re-read the series from the beginning. There are so many good scenes and characters and dialog that I can’t resist it. So I go back and read the first two books, at which point I discover that these are really wonderfully dense books in which the plot and action just keeps coming, and so I can’t really read more than two in a row without beginning to feel a bit glutted. But glutted with awesome! Eventually I’ll have simply memorized the first two, and then I’ll be able to move on to the third and fourth book, I suppose, and I’m very excited about that prospect. But in the mean time, I have to go back and re-read the scene in which Temeraire hatches, and their first air battle, and when Laurence confronts Rankin, and has dinner with Roland, and… and… and…! Anyway, plot: This is historical fiction based around the Napoleonic War… with dragons. As it turns out, I like historical fiction a lot more when there are dragons inserted. Especially these dragons. The main character is Captain Will Laurence, formerly of the British Navy. A variety of circumstance, however, lead him to harnessing a young dragon, Temeraire, at which point, he was, perforce, part of the British Aerial Corp. 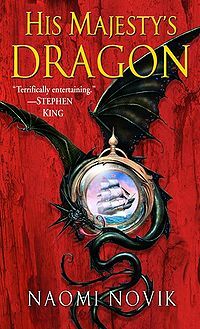 While the war is, of course, a large driving force for the plot, a larger part circles around the differences between the very formal British society that Laurence is accustomed to, the more casual environment of the Aerial Corp, which bridges that of British society and that of the dragons, and the dragon perspective. While Will Laurence and many of the other characters are definitely characters of their time period, the dragons often act as an outside perspective on events and social mores. Dragons, for instance, have their own perspective on sexism and slavery and right and wrong, which isn’t really anachronistic because, well, they’re dragons. His Majesty’s Dragon and Throne of Jade both really come together because Temeraire is an absolute delight, Laurence is wonderful in his awkward formality and concepts of honor, and they are absolutely devoted to each other, which just makes their differences with and regarding the world around them all the more apparent. It’s a story about the love of a man for his dragon, and a dragon for his man. Anyway, these are wonderful books and I definitely recommend them.